FOR A TOTAL DISCOUNT OF PHP 1,500! 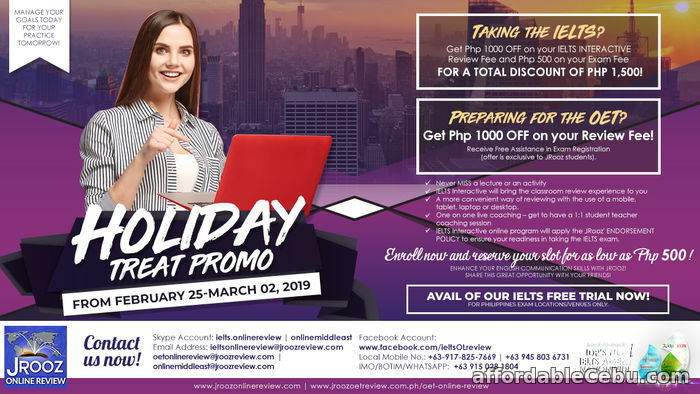 Get Php 1000 OFF on Review Fee! (offer is exclusive to JROOZ students). NEVER MISS a lecture or an activity! A more convenient way of reviewing with the use of a mobile, tablet, laptop or desktop. IELTS Interactive online program will apply the JROOZ’ ENDORSEMENT POLICY to ensure your readiness in taking the IELTS exam. ENROLL NOW and reserve your slot for as low as PHP 500! Enhance your English communication skills with JROOZ! Share this great opportunity with your friends! Avail of our IELTS FREE TRIAL now!